Josephine Nordegren is one of three sisters who grew up nearly wild in southwestern Colorado. She has the archery skills of Robin Hood and the curiosity of the Little Mermaid, fascinated by but locked away from the forbidden outside world--a world she's been raised to believe killed her parents. When David Warden, a rancher, brings in a herd much too close to the girls' secret home, her older sister especially is frightened, but Jo is too interested to stay away. David's parents follow soon on his heels, escaping bandits at their ranch. David's father is wounded and needs shelter. Josephine and her sisters have the only cabin on the mountain. Do they risk stepping into the world to help those in need? Or do they remain separated but safe in the peaks of Hope Mountain? Mary Connealy writes "romantic comedies with cowboys" and is celebrated for her fun, zany, action-packed style. She has more than half a million books in print. She is the author of the popular series Wild at Heart, The Kincaid Brides, Trouble in Texas, Lassoed in Texas, Sophie's Daughters, and many other books. Mary lives on a ranch in eastern Nebraska with her very own romantic cowboy hero. Learn more at www.maryconnealy.com. 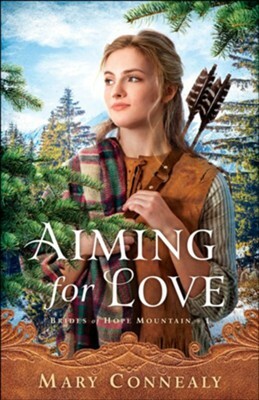 I'm the author/artist and I want to review Aiming for Love (Brides of Hope Mountain Book #1) - eBook.